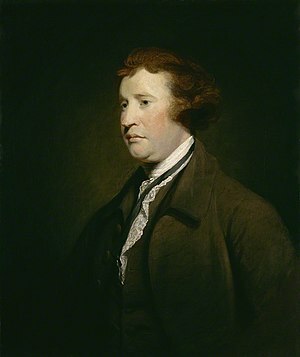 Edmund Burke (1729-1797) was one of eighteenth century England’s great political writers. He enjoyed a long career as an author, orator, and Whig party statesman (“Edmund Burke”). Widely regarded as the father of modern Conservatism, Burke’s early rebuke of the French Revolution (1789-1799) and accurate predictions of its eventual fate garnered him wide and long-lasting influence among later conservative and reactionary thinkers. In Reflections on the Revolution in France (1790), Burke concludes with a sustained discourse on the essential roles played by social hierarchy and religion, but especially religion, in the formation and stabilization of civil society (Burke 516–521). For Burke, religion is “the first … prejudice” (Burke 518) upon which social order, itself necessary to bear forth the fruits of learning, commerce, trade, and manufacture, can only be established (Burke 517). In its assault on religion and hierarchy, Burke believed France was committing national suicide (Burke 506) – a death from which only a violent, monstrous tyranny could be resurrected (Burke 517). In defense of religion, Burke first argues that “man is, by his constitution, a religious animal” (Burke 518), and that, consequently, atheism – being “adulterated metaphysics” – is against man’s reason and instincts (Burke 518). 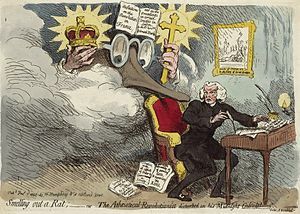 Though he doesn’t directly support these claims, he does assert that 99% of the English would choose even an absurd or distorted religion over atheism (Burke 517), which he equates with “uncouth, pernicious, and degrading superstition” (Burke 518), presumably because the choice comes naturally to an animal so constituted. Indeed, Burke seems to believe that social virtues are inseparable from religion, which is, he claims, “the source of all good” (Burke 517); for him, secular ethics must be a contradictory phrase. He speaks of atheism as being inseparable from hypocrisy, avarice and rapacity; an infectious “unhallowed fire” (Burke 518) that makes “a philosophy and a religion [of its] hostility to such institutions” (Burke 518). All these characteristics of atheism and, it would follow, of atheists, must be unnatural insofar as they are contrary to the traditional moral teachings of (Christian) religion. But if religion is natural, and if Christianity is a superior religion (as Burke clearly believes, see page 518), why should civilized man struggle so with adherence to its (and his native) moral precepts? Burke’s supposition that man is, by his nature, a religious animal is well supported by modern evolutionary science (though whether the capacity for and tendency toward religious belief among humans are 1) by-products of selectively adaptive cognitive circuitry evolved for other purposes, or 2) “hardwired” at the genetic level, is debated; see Wikipedia’s Evolutionary Origins of Religion and Evolutionary Psychology of Religion for an introduction to the relevant theories), but totally undefended in his argument. He seems to regard the naturalness of religion as self-evident both from man’s capacity for it and, especially, from the benefits it bestows to societies established upon it, which forms the second of his arguments. Burke also asserts that religion “is the basis of civil society” (Burke 517) and the builder and preserver of states (Burke 518), for which he offers three lines of reasoning. In the first, he suggests that rulers of consecrated states who “stand in the person of God” will direct the state with “high and worthy notions of their function and destination” because religion (properly constituted) gives them hope of immortal glory and reward for right rule (Burke 518). Such a principle (as eternal consequences), Burke argues, should be taught to and reinforced in persons of power – a proper role of religious institutions. He considers belief in eternal consequences (posited and supported by religion) to be of such import to good governance and so essential to the full realization of man’s potential that, in transition to his second line of reasoning, every moral, civil, and political institution of positive effect should be marshaled to support the “rational and natural ties that connect … human understanding and affections to the divine” (Burke 518–519). Man requires religious education, cultivation, and enculturation to attain his full stature; these are necessary all the more when man wields power over others (Burke 519). Third, Burke suggests that the “consecration of the state” by religion is necessary to impress a “wholesome awe” among its citizens regarding the trust of their duty to it (Burke 519). Again, it is religion’s promises of omniscient judgment and eternal consequences that, according to Burke’s argument, so well serve man by legitimizing and preserving the state (Burke 520). Vision Quest; man is a religious animal. Burke’s third argument in defense of religion posits a redoubled extension of portions of the second. That is, religion’s propositions of divine judgment (and accompanying threat of eternal punishment or promise of everlasting reward) and state consecration are even more crucial to democracy than to aristocracy (Burke 519) because the empowered masses are less constrained by the “fame and estimation”, i.e., reputation, that motivates and shapes the behaviors of powerful individuals (Burke 519). This excuse from the infamy due misdeeds in public acts may be confused with approval (Burke 519) and forward license to the same, wherein officials lose “all moral principle, all sense of dignity, all use of judgment, and all consistency of character” (Burke 519). For Burke, only through religion may any popularly governed people empty “themselves of all the lust of selfish will” in the delegation of the state’s powers (Burke 519). Through religious consecration, the masses may appoint to political offices with the reverence due to “a holy function” (Burke 519), with recognition, derived from the religio-cultural principles necessary for the state’s sustenance, of the responsibility to connect future generations to their past (Burke 520). Burke’s arguments for why England, or any state, should keep its “church establishment” strongly foreshadows a great deal of modern science’s conclusions as to why religion exists in the first place, i.e., utility in the stability of social identity and political order. Burke’s only failure comes from the assumption that morality – that great social lubricant – is the exclusive domain of religion, and that moral behavior is derived from it (inferred from his arguments). Contrarily, evidence from comparative studies of a variety of social species, paleo-anthropological findings, and psychological experiments suggest that human morality is innate and predates religion (“Evolution of Morality”), which was originally epistemological rather than moral (“Evolutionary Origin of Religions”). But just as Burke suggests, (organized) religion’s innovations (beginning during the Neolithic revolution) were the establishment of group identity necessary for political stability (Burke 521), the expansion of socio-moral scrutiny to include supernatural agents and eternal consequences (Burke 518), and the consecration of the state’s authority (Burke 519) (“Evolutionary Origin of Religions”). His insight into religion’s functional role in human society, not as the author of absolute truth, but as the guarantor of indispensable order, deserves recognition and applause. Burke, Edmund. “Reflections on the Revolution in France.” Modern Political Thought: Readings from Machiavelli to Nietzsche. 2nd ed. Ed. David Wootton. Hackett Pub Co, 2008. 502–525. Print. “Edmund Burke.” Wikipedia, the free encyclopedia. Encyclopedia. Web. 6 Mar. 2012. “Evolution of Morality.” Wikipedia, the free encyclopedia. Encyclopedia. Web. 6 Mar. 2012. “Evolutionary Origin of Religions.” Wikipedia, the free encyclopedia. Encyclopedia. Web. 6 Mar. 2012. —. Wikipedia, the free encyclopedia. Encyclopedia. Web. 6 Mar. 2012. “Evolutionary Psychology of Religion.” Wikipedia, the free encyclopedia. Encyclopedia. Web. 6 Mar. 2012.